His greatest deed - he legitimized all his illegitimate children, gave them education, position in society and married them in such way, that they become real princes and princesses. His first love was Maria Mancini. 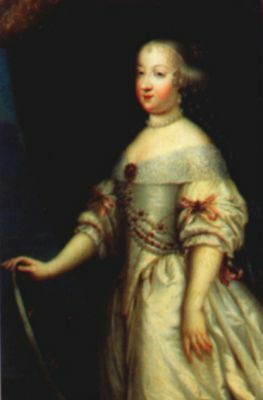 She was niece of Cardinal Mazarin. 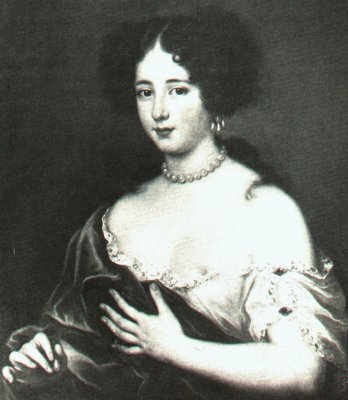 Maria was good educated and made Louis to be interested in literature. 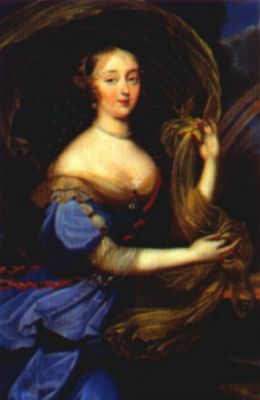 Louis felt in love with her and they were several years together until he had to marry Marie-Therese of Austria. 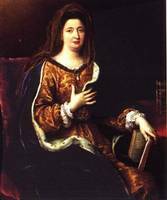 That was a very hard step for him - his love was so strong, that he wanted Maria Mancini to be his wife, although he was a king. 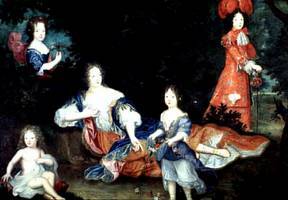 After he married Marie-Therese, he devoted himself to her and a year later they had a dauphin. But later he began to pay too much attention to the ladies of his court. 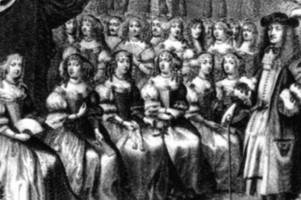 One of his lovers was the wife of his own brother- Henrietta of England. 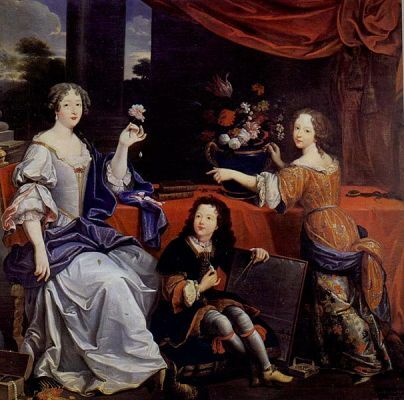 Louis was the most powerful man in Europe and every woman was dreaming to be his mistress. In 1682, as he was 45 years old, he decided that he does not have much time to live and that he has to live according to church laws in order to be later in paradise and not in hell. So he decided to be only with his wife. Unfortunately Marie-Therese died a year later, so Louis was forced to marry somebody else. As he didn't want to marry another princes from foreign land, he decided to marry somebody from his court. 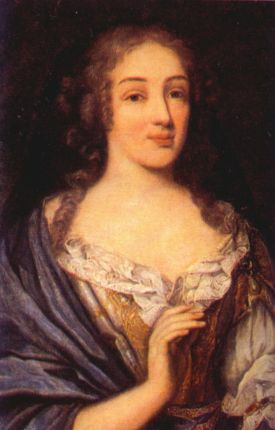 His choice was Madame de Maintenon, who was the best educated woman at the court. He married her secretly in 1683 and he had never had any other woman after that (for 32 years). What about his "man power"- it's known, that at the age of 72 years he was making love with his wife 2 times a day. Infanta of Spain, daughter of Felipe IV, King of Spain 1621-1665 and Princess Elisabeth de France, Born 20 September 1638 Madrid Louis married her in order to make peace with Spain and, as you could read it on the top of that page, he was not exited of that marriage. Louis never loved her, but he was coming to her every night to fulfill his husband's duty. They had a lot of children (almost all of them died in infancy). 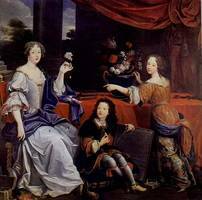 She loved him all her life and she was very happy in 1682 as Louis decided to be only with his wife. She was not very clever, she never learned french language well: she was almost alone. 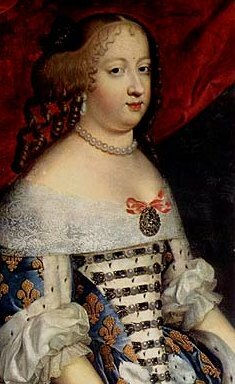 Died on 30 July 1683 in Versailles in the age of 45 years.